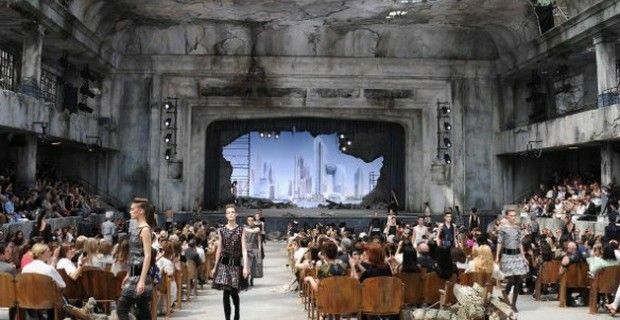 During the Paris Fashion Week, Chanel presented its 2013-2014 Fall and Winter collection, which took place at the Grand Palais, that Karl Lagerfeld decided to turn into a post-apocalyptic futuristic theatre. Celebrities flocked to see what Chanel had come up with for their new haute-couture collection, and sitting on the front row were Rihanna -who was soundly booed when she arrived outside the fashion show, - Kristen Stewart, Michael Pitt, Catherine Martin, Baz Luhrmann, Ines de La Fressange, Virginie Ledoyen, Cecile Cassel, Natalia Vodianova, Carole Bouquet, Julia Restoin Roitfeld, Tallulah Harlech, Milla Jovovich and Alexa Chung. The newest Chanel collection saw a number of iconic jackets make their way down the runway, with luxurious eye-catching fabrics like tweed and beautiful bouclé wool. The silhouettes were very geometric, with Korean collars making their appearance on the impeccable and elegant outfits that, featured sober monochromatic tones of black, grey or blue. The jackets were paired with short and lightly flared skirts in matching fabrics or contrasting colors, and no real pumps or court shoes were in sight on the models, just cuissardes - tight, thigh high suede boots - with comfortable heels, or just suede or leather ankle boots, that will no doubt be largely copied by the retail shoe industry for this upcoming winter. A few of the outfits were brightened up by small glittering sequins that were seen on the day wear, and on the stunning and evening wear, that also featured flowing webs of crystals or small tiny mirrors on transparent and metallic colored flowing tunics. One of the most important accessories in the collection were the belts that were integrated onto both the day and evening outfits. They were large, and rested lightly on the hips, in order to lightly break up and compliment the long lines of the silhouettes.